In conventional CMR, bulk cardiac motion causes target structures to move in and out of the image plane. This results in poor localisation of subtle features and causes systematic errors in the measurement of flow and perfusion. Retrospective motion correction is only possible if comprehensive 3D acquisitions are obtained. To attain optimal data acquisition efficiency, it is necessary to prospectively track the tissue motion and adapt the imaging plane during data acquisition. In contrast to respiratory-induced motion tracking, there has been little progress so far in correcting cardiac motion . 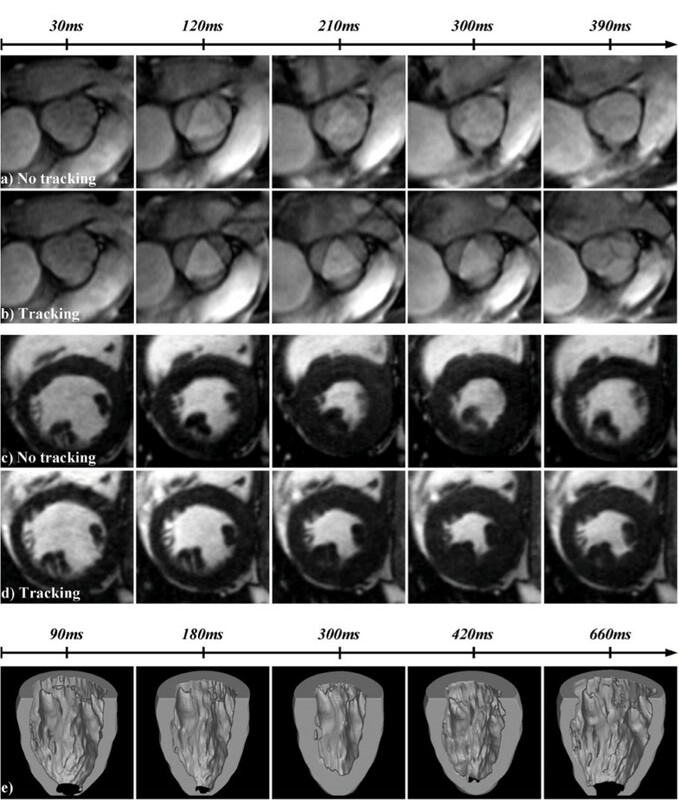 This paper demonstrates the use of COMB tagging for prospective tissue tracking in CMR and its value for valve imaging and accurate delineation of mobile structures such as ventricular trabeculae. To compensate for the motion of the target area of interest, a cine gradient echo echo-planar sequence with a tagging pre-pulse (selective COMB and non-selective 90° pulse pair) was developed. By employing a COMB pre-pulse, simultaneous tagging of multiple parallel short-axis planes was possible. Full rigid-body 3D motion of each slice, excluding rotation, is captured by automatic non-rigid image registration of the COMB image sequence . This is performed in real-time whilst the subject remains in the scanner for subsequent adaptive imaging. To resolve the 3D motion of each plane, interleaved horizontal and vertical long axis image planes were acquired, with tagging performed in the orthogonal short-axis plane, as shown in Figure 1a. For subsequent adaptive imaging, a breath-hold shared-phase cine balanced-SSFP sequence with real-time adaptation to the orientation and offset of the target tissue of interest as determined by the COMB pre-scan was used to adapt each k-space acquisition accordingly. To evaluate the intrinsic accuracy of the tracking technique, phantom validation was performed with simulated sinusoidal motion. In vivo validation was performed on 8 healthy volunteers (7 male, 1 female, age 23 to 41) by verifying the automatic approach against manual off-line tracking from 10 experts. (a) Four short-axis COMB tags on the left ventricle automatically tracked (green lines) from interleaved HLA (top) and VLA (bottom) views. (b) Through-plane motion of the tracked tags (blue lines) against the mean (red lines) and standard deviation (red dotted lines) of 10 manual delineations. The automatic approach incorporates the starting tag location at t = 2.5 ms and is therefore more accurate at early systole and end diastole. The phantom study demonstrated an absolute accuracy of ± 0.64 mm. In the in vivo study, the automatic approach was shown to be equivalent to manual delineation (see Figure 1b), but with reproducibility and six times greater performance (~30 seconds). To demonstrate the clinical significance of the technique, motion compensated imaging of the aortic root and both left and right ventricles was performed. As shown in Figure 2, the technique clearly reveals cyclic morphological changes in the aortic valve leaflets. Furthermore, the complex motion of the trabeculae can be quantified for the first time, showing detailed morphological structure and quantified bio-medical indices (circumferential and radial strain, papillary muscle shortening). Aortic valve with (a) static and (b) motion-adaptive acquisition. Short-axis slice through left ventricle with (c) static and (d) motion-adaptive acquisition. (e) Volume renderings showing detailed trabeculation as depicted by the adaptive imaging technique. The methods developed will facilitate the evaluation of diseases such as ischemic heart disease, valve disease and insufficiency, isolated ventricular non-compaction and arrythmogenic ventricular dysplasia. It will also have implications on future CMR sequence design, allowing motion-compensated measurements of flow and myocardial perfusion.